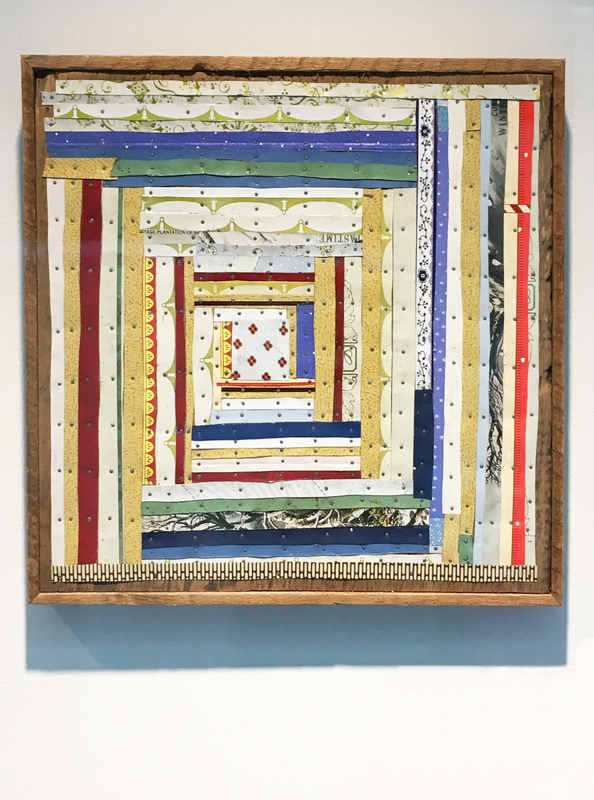 Handwork is an exhibition of new work by Pittsburgh artist Kim Fox, currently on view in Contemporary Craft's BNY Mellon Satellite Gallery in the lobby of the Steel Plaza T-Station downtown. Six works are presented, ranging in size from the large-scale Eight-Pointed Star Quilt II (2018), a work that employs two salvaged wooden barn doors for its support, to the more intimate Log Cabin Quilt Block (2018), scaled to the size of the reclaimed wood lath that frames the composition. Fox engages a range of found materials, including vintage tin, paper dress patterns, and a tabletop that was used to cut glass in a hardware store, as seen in Blue Honeycomb (2018). In some cases, Fox links these materials to their previous location and function in manufacturing towns around Pittsburgh. Through wall-text information, we learn that the tabletop came from Clairton, PA, home of U.S. Steel's Clairton Works, the largest coke-producing facility in the United States. The salvaged wood used in another work, Honeycomb (2018), was found at the Jeannette Glass Works, defunct since 1983, but once one of Pennsylvania's premier consumer glass manufacturers. In conjunction with these echoes of the region's industrial history, Fox's use of forms and patterns drawn from the world of quiltmaking reflects parallel traditions in the area's production of housewares and crafts. In Handwork, references to mechanized industry and factory production interface with the aesthetics of homemade, hand-stitched textile work to evoke a complicated reading of gender. Materials and techniques associated with masculinized spaces such as the factory floor and the realm of hard labor intersect with interior, domestic spaces often coded as feminine. The works allow layers of meaning to accumulate as found objects join together with the mark-making, collaging, and repetitive ordering that reveals the artist's working process. Fox combines materials and techniques from craft practice with more conventional fine art approaches, effectively playing with embedded hierarchies about which forms are most valuable or visually provocative. Through her material exploration of these binary constructions —masculine/feminine, public/private, fine art/craft, work/hobby — Fox's work unravels dichotomies to present a composite, layered meditation on labor, place, and the convergence of past and present. Bringing new interpretations to traditional paradigms of gendered space, material, and form is central to Fox's visual language, and reverberates with the work of Katie Ott, another Pittsburgh-based artist whose work is currently on view in the University Art Gallery (UAG) at the University of Pittsburgh. Part of the student-curated exhibition This is Not Ideal: Gender myths and their transformation, Ott's work makes a queer and intersectional feminist intervention into the historically masculine domains of woodworking and furniture-making, literally turning the tables on established gender norms around art and craft practice.